The Inner Lip Plates help promote dignity and independent eating by allowing individuals who would normally have difficulty feeding themselves to do so. The Inner Lip Plate is specifically designed for the those with limited muscle control, individuals with the use of just one hand or arm, children or those with limited or no vision. The deep inner lip keeps food from sliding off the plate. 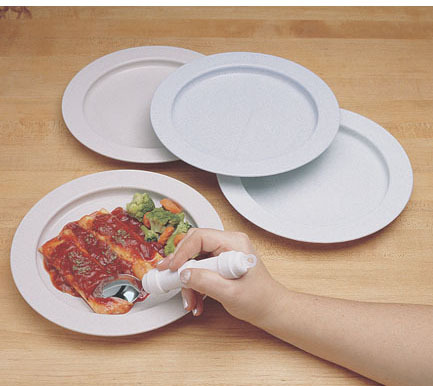 The user brings the fork or spoon to the edge of the plate and pushes the food onto the utensils. Constructed of durable plastic, the nine inch diameter plates are dishwasher, autoclave and microwave safe. 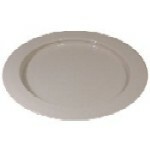 Available in quantities of two, the plates are available in sandstone or red. The new Redware was created after studies found that individuals with Alzheimer's and poor vision ate more using red plates. Often these individuals lose interest in eating and the bright redware successfully entices them to eat more. The Inner Lip Plate with Non-Skid Base is made of the same plastic material as the regular but with the addition of an adhesive pad which is placed on the bottom of the plate to prevent sliding. The Non-Skid Inner Lip plates are not dishwasher or microwave safe.